Comet 300208A - White Compression spring for 770/780/790/858 Series secondary pulleys. Now sold separately from the "QDS-500 Kit". 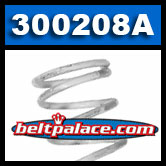 The 300208-A Cam Spring can be installed in place of the standard spring in 770/780/790/858 Series Comet Driven units. It will allow the units to be mounted either Inboard or Outboard facing. This is especially advantageous when re-powering your older equipment and things don't quite go back together like they did originally!